Following the publication of a notice of impending expiry (1) of the countervailing measures in force on imports of sulphanilic acid originating in India (‘the country concerned’), the European Commission (‘the Commission’) has received a request for review pursuant to Article 18 of Council Regulation (EC) No 597/2009 of 11 June 2009 on protection against subsidised imports from countries not members of the European Community (2) (‘the basic Regulation’). The request was lodged on 1 July 2013 by CUF — Químicos Industriais (‘the applicant’), the sole producer of sulphanilic acid in the Union thus representing 100 % of the Union production. The product under review is sulphanilic acid originating in India (‘the country concerned’), currently falling within CN code ex 2921 42 00. The measures currently in force are a definitive countervailing duty imposed by Council Regulation (EC) No 1010/2008 (3). The applicant has provided prima facie evidence that the expiry of the measures would lead to continuation of subsidisation and recurrence of injury. As to the continuation of subsidisation, the applicant alleges that the producers of the product under review in India have benefited and will continue to benefit from a number of subsidies granted by the Government of India. These alleged subsidies consist of benefits for industries located in export processing zones/export oriented units; the duty entitlement passbook scheme; the export promotion capital goods scheme; the income tax exemption scheme; the advance license scheme/advance authorisation scheme; the export credit scheme; the focus market scheme; the focus product scheme; the duty free import authorisation; the status holder incentive scrip; the duty drawback scheme; the package scheme of incentives of the Government of Maharashtra; scheme for assistance to micro, small and medium enterprises of the Government of Gujarat; the Gujarat sales tax incentive scheme and the Gujarat electricity duty exemption scheme. The total subsidy is estimated to be significant. The applicant alleges that the above schemes are subsidies since they involve a financial contribution from the Government of India or other regional governments and confer a benefit to the recipients, i.e. to exporting producers of sulphanilic acid. They are alleged to be contingent upon export performance and therefore specific and countervailable or to be otherwise specific and countervailable. As to the likely recurrence of injury, the applicant has provided evidence that, should measures be allowed to lapse, the current import level of the product under review from the country concerned to the Union is likely to increase due to the existence of unused capacity of the exporting producers in India, the existence of trade barriers for the country concerned in the USA and the attractiveness of the EU market. The prima facie evidence provided by the applicant shows that, on the basis of the volumes and the prices of the exports of the like product from India to other countries, such increased imports to the Union are likely to have, among other consequences, a negative impact on the quantities sold, the level of prices charged by the Union industry and the market share held, resulting in substantial adverse effects on the overall performance of the Union industry. The investigation will determine whether the expiry of the measures would be likely, or unlikely, to lead to continuation or recurrence of subsidisation and injury. In order to obtain the information it deems necessary for its investigation with regard to exporting producers, the Commission will send questionnaires to the exporting producers selected to be in the sample, to any known association of exporting producers, and to the authorities of the country concerned. In order to obtain the information it deems necessary for its investigation with regard to Union producers, the Commission will send questionnaires to the known Union producer or representative Union producers and to any known association of Union producers. 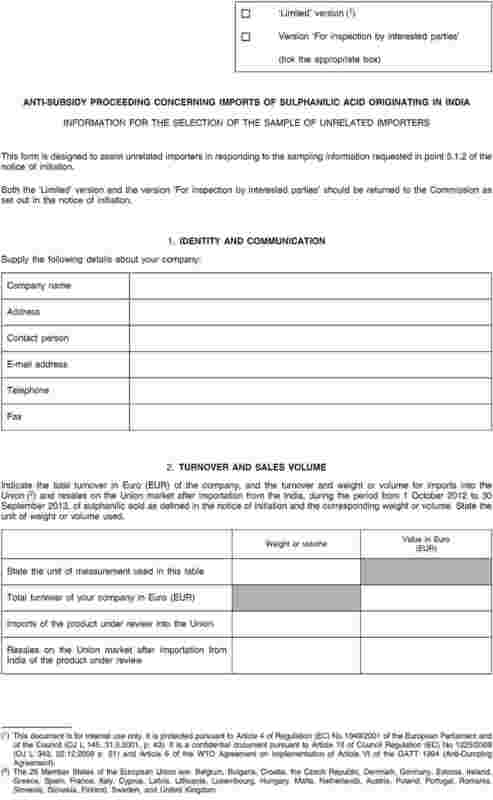 The Union producer and the associations of Union producers must submit the completed questionnaire within 37 days of the date of publication of this notice in the Official Journal of the European Union, unless otherwise specified. The questionnaire will request information on, inter alia, the structure of their company(ies) and the financial and economic situation of the company(ies). Should the continuation of subsidisation and the continuation of injury be confirmed, a decision will be reached, pursuant to Article 31 of the basic Regulation, as to whether the maintenance the anti-subsidy measures would not be against the Union interest. 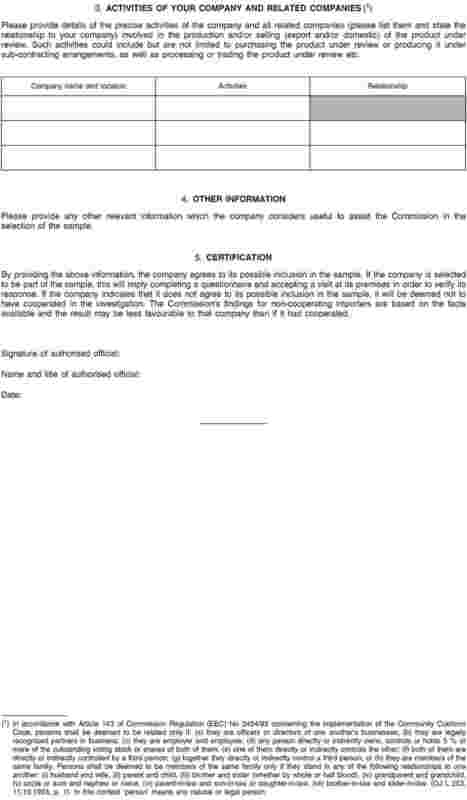 Union producers, importers and their representative associations, users and their representative associations, and representative consumer organisations are invited to make themselves known within 15 days of the date of publication of this notice in the Official Journal of the European Union, unless otherwise specified. In order to participate in the investigation, the representative consumer organisations have to demonstrate, within the same deadline, that there is an objective link between their activities and the product under review. All interested parties may request to be heard by the Commission investigation services. Any request to be heard should be made in writing and should specify the reasons for the request. For hearings on issues pertaining to the initial stage of the investigation, the request must be submitted within 15 days of the date of publication of this notice in the Official Journal of the European Union. Thereafter, a request to be heard must be submitted within the specific deadlines set by the Commission in its communication with the parties. Interested parties may request the intervention of the Hearing Officer of Directorate-General for Trade. The Hearing Officer acts as an interface between the interested parties and the Commission investigation services. The Hearing Officer reviews requests for access to the file, disputes on the confidentiality of documents, requests for extension of time limits and requests by third parties to be heard. The Hearing Officer may organise a hearing with an individual interested party and mediate to ensure that the interested parties' rights of defence are being fully exercised. A request for a hearing with the Hearing Officer should be made in writing and should specify the reasons for the request. For hearings on issues pertaining to the initial stage of the investigation, the request must be submitted within 15 days of the date of publication of this notice in the Official Journal of the European Union. Thereafter, a request to be heard must be submitted within specific deadlines set by the Commission in its communication with the parties. (1) OJ C 28, 30.1.2013, p. 12. (3) OJ L 276, 17.10.2008, p. 3. (4) An exporting producer is any company in the countries concerned which produces and exports the product under investigation to the Union market, either directly or via third party, including any of its related companies involved in the production, domestic sales or exports of the product concerned. (5) Only importers not related to exporting producers can be sampled. 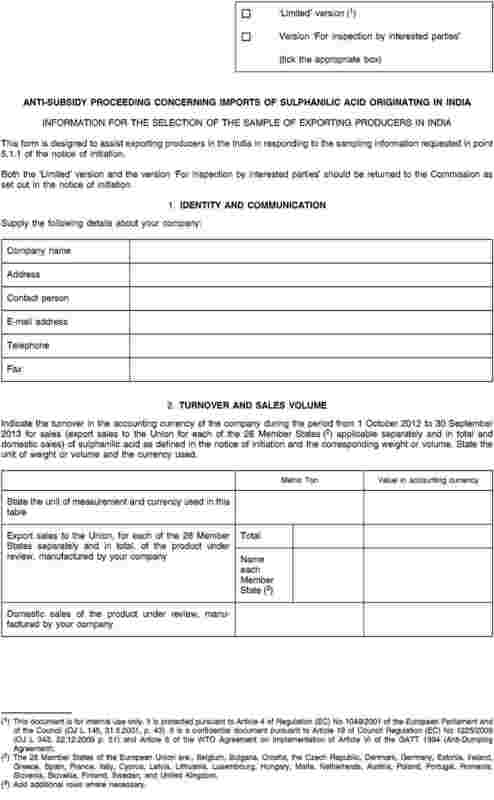 Importers that are related to exporting producers have to fill in Annex I to the questionnaire for these exporting producers. 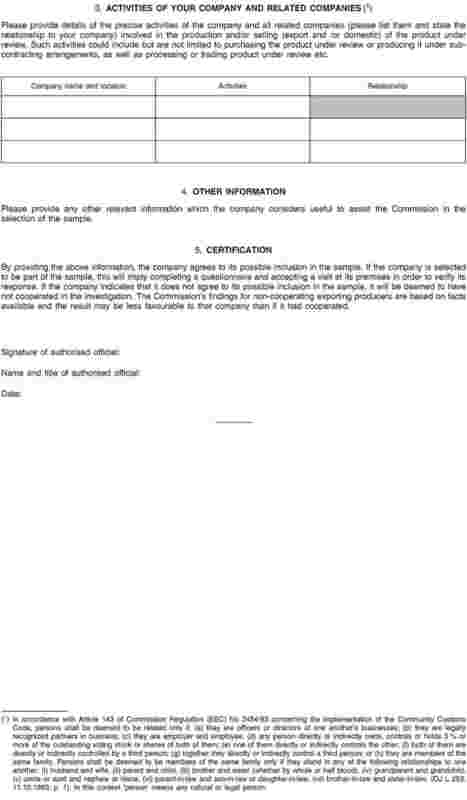 In accordance with Article 143 of Commission Regulation (EEC) No 2454/93 concerning the implementation of the Community Customs Code, persons shall be deemed to be related only if: (a) they are officers or directors of one another's businesses; (b) they are legally recognised partners in business; (c) they are employer and employee; (d) any person directly or indirectly owns, controls or holds 5 % or more of the outstanding voting stock or shares of both of them; (e) one of them directly or indirectly controls the other; (f) both of them are directly or indirectly controlled by a third person; (g) together they directly or indirectly control a third person; or (h) they are members of the same family. Persons shall be deemed to be members of the same family only if they stand in any of the following relationships to one another: (i) husband and wife; (ii) parent and child; (iii) brother and sister (whether by whole or half blood); (iv) grandparent and grandchild; (v) uncle or aunt and nephew or niece; (vi) parent-in-law and son-in-law or daughter-in-law; (vii) brother-in-law and sister-in-law (OJ L 253, 11.10.1993, p. 1). In this context ‘person’ means any natural or legal person. (6) The data provided by unrelated importers may also be used in relation to aspects of this investigation other than the determination of subsidisation.